In a Photoshop Elements 11 clipping mask, the bottommost layer (also known as the base layer) acts as a mask for the layers above it. The layer or layers above clip to the opaque areas of the base layer and don’t show over the transparent areas of the base layer. Creating a clipping mask works well if you want to fill a shape or some type with different images on multiple layers. Using the steps that follow, you can open an image and convert the Background to a layer. Then use the Custom Shape tool to create a shape of an alarm clock on another layer and put that layer underneath the layer of the actor. Then create a clipping mask between the actor and the shape of the alarm clock. Then you can add a new layer, fill it with white, and make it the bottommost layer. In the Photo Editor, in Expert mode, open or create an image that has several layers. To best see how this technique works, try creating a shape layer for your base layer. Arrange your layers so that your base layer is the bottommost layer. Hold down Alt (Option on the Mac) and, in the Layers panel, position the mouse cursor over the line dividing the base layer and the layer above it. The cursor changes to two overlapping circles with a small arrow icon. 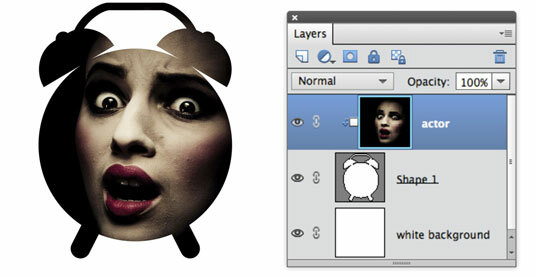 You can also choose Layer→Create Clipping Mask. Repeat Steps 3 and 4 for any remaining layers you want clipped to the base layer. Notice how our actor image clips to the base layer (the alarm clock shape) in the Layers panel (appears indented). Nothing outside the boundaries of the clock shape is visible on the layer in the clipping mask. The down arrow icon beside the layer on the Layers panel indicates that the layer is clipped. The clipped layers take on the opacity and Blend mode of the base layer. Remove a layer from the clipping mask. Alt-click (Option-click on the Mac) the line between the two layers in the Layers panel. Or, you can select the layer and choose Layer→Release Clipping Mask. Both commands remove from the clipping group the selected layer and any layers above it. You can also apply clipping masks to adjustment and fill layers. If you clip between a regular layer and an adjustment layer, or between a regular layer and a fill layer, the adjustment or fill layer affects only the pixels of the adjacent underlying layer rather than all the underlying layers.